Margaret Atkins, Carol Watson, Peter Gacsall, Ian Watson. Roger Willmott, Carolyn Worth, Sue Willmott, Roger Green. Also: Keith Holman, Janet Hawkins, Tom Palmer. Jennie Sandford, Carol Watson, Ian Watson, Keith Holman. Roger Willmott, Paul Sandford, Ian Watson, Keith Holman. Carol Watson and Sue Willmott. Roger Green, Ian Watson, Peter Gacsall. Margaret Atkins, Shirley Foxwell, Carol Watson, Sue Willmott. Adam Harding, Ian Watson, Keith Holman. Sussex CBA Two Wood Singles Winner: Martin Pelosi. Jennie Sandford, Carol Watson, Sue Willmott. Border League Division 2 Winners. Roger Willmott, Peter Gacsall, Alan Gardiner, Terry Hughes. Carol Watson, Sue Willmott, Terry Hughes, Ian Watson. Margaret Atkins, Shirley Foxwell, Roger Green, Tom Palmer. Also: Keith Holman, Janet Hawkins, Roger Willmott. Ian Watson and Keith Holman. Mid-Sussex League Division 1: Runners-up. Sussex Singles finalist: Carol Watson. Sussex Champion of Champions finalist: Keith Holman. 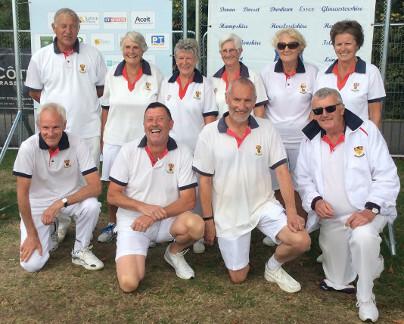 Carol put up with a painful thumb injury to bowl superbly well all season, just losing out to an opponent from Eastbourne in the county singles final 21-14, but still qualifying for the Nationals at Leamington, where she reached the 3rd round. 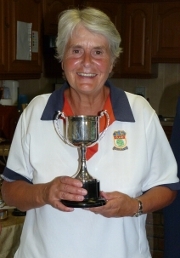 Carol also won two club competitions - the ladies Two Wood singles, and the ladies pairs. Bowls England Mens Fours Q/Finalists: Graeme Geddie, Adam Harding, Ian Watson, Keith Holman. Sussex Fours winners: Graeme Geddie, Adam Harding, Ian Watson, Keith Holman. Sussex Pairs finalists: Chris Reynolds & Roger Green. Jennie Holland, Chris Sugarhood, Carol Watson, Sue Willmott (plus M.Atkins & D.Keogh). Bowls England National 55 & Over Pairs Q/Finalists: Ian Watson & Keith Holman. Shirley Nelson, Janine Scola, Sue Paterson, Vera Stevens (plus Shirley Foxwell). Jennie Holland, Chris Sugarhood, Carol Watson, Sue Willmott. Sussex Singles finalist: Keith Holman. Sussex 2 Wood Singles finalist: Ian Watson. Sussex Champion of Champions finalist: Adam Harding. Bowls England National Mixed Pairs qualifiers: Carol Watson & Keith Holman. Gladys Rowland single rink: Finalists. Nicholas Soames Aussie Pairs: Finalists. Sussex Singles Champion: Ian Watson. Sussex Fours winners: Graeme Geddie, Adam Harding, Keith Holman, Ian Watson. Chris Reynolds, Carol Watson, Tom Palmer, Keith Holman. Adam Harding, Roger Willmott, Sue Willmott, Dave Richardson. Sussex Triples finalists: Adam Harding, Keith Holman, Ian Watson. Adam Harding, Ken Anderson, Tom Palmer, Ian Watson. Graeme Geddie, Derek Heather, Dave Richardson, Keith Holman. Bowls England National Mixed Pairs finalists: Sue Willmott & Dave Richardson. Bowls England National Pairs qualifiers: Adam Harding & Keith Holman. Sussex CWBA Pairs finalists: Carol Watson & Sue Willmott. Sue Willmott, Shirley Foxwell, Derek Heather, Dave Richardson. Eastbourne Open Singles and Pairs: Dave Richardson. Bexhill Open Singles and Pairs: Dave Richardson. Worthing Pavilion Sunday Pairs: Dave Richardson & Adam Harding. Southwick Open Mixed Fours: Roger & Sue Willmott, Carol Watson, Dave Richardson. Jubilee Triples Winners: Malcolm Peters, Chris Thomas, Terry Hughes. Jubilee Triples Winners: Roger Green, Derek Heather, Alan Golds. Sussex Fours finalists: Chris Reynolds, Graeme Geddie, Alan Clarke, Ian Watson. Jubilee Triples Winners: Geoff Nelson, Wilf Atkins, Malcolm Fever. EBA National Triples q/Finalists: Chris Reynolds, Graeme Geddie, Ivan Orchin. Sussex Triples finalists: Chris Reynolds, Graeme Geddie, Ivan Orchin. Jubilee Triples Winners: Bert Farmer, Dennis Howard, Alan Golds.